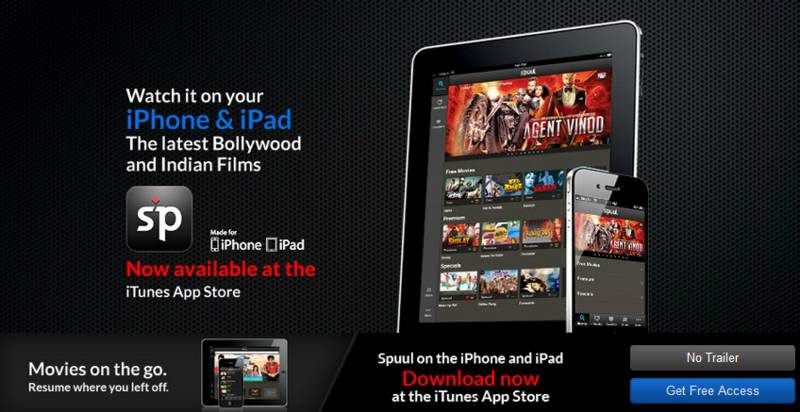 Fans of Bollywood and other Indian films have a new option for watching movies on the go after streaming service Spuul launched an iOS app, bringing its catalogue of content from the Asian country to owners of the iPad, iPhone and iPod Touch worldwide. The app includes subtitles and allow users to resume watching movies from where they left off via their desktop, iPhone, iPod Touch or iPad. There are incentives attached to inviting friends on to the service, with the chance of winning free access to Spuul’s premium movies and other prizes up for grabs for referrals. As well as launching its debut mobile apps, Spuul has added a ‘Stars’ section to its homepage to help users find content from their favourite Bollywood actors and actresses, and discover new films and other top stars. The service launched in beta in early April and currently has a collection of more than 280 titles from a range of top-tier studios. That catalogue is being added to on a daily basis, the startup’s chief product officer Michael Smith told The Next Web. Spuul has particularly innovative pricing options, which includes three distinctly different plans, each of which is ad-supported. On the most basic level, visitors can enjoy free and unlimited access to selected films in its ‘Forever Free’ category. A monthly $4.99 ‘all you can eat’ subscription grants unlimited access to its ‘Premium’ films, while its blockbuster titles — ‘Specials’ — are available at a one off $0.99 price per title. Rather than limiting access to Special titles from the moment users hit the play button, each purchase gives 72 hours of playback on the film. This avoids a ’48 hours to watch’ scenario and gives viewers more time enjoy each film at their own pace, not to mention better value. Looking at big global markets for movies, you have English films — catered for by the likes of Hulu and Netflix — then the Chinese market, due to sheer population and size of industry, and the next one is India. There are tens of millions of Indians overseas, coupled with the amount in India, and yet there’s nothing for them that caters to quality online video content. The app is available worldwide and Smith points out that India’s entertainment industry is popular across the globe. The Indian diaspora in the US and Europe make those regions key markets, while Africa and the Middle East are two other areas where India films are particularly well watched, he says. While Bollywood is catered to in part by a number of other video services, including Southeast Asia focused-Viki, Smith says that Spuul is “trying to put it all together” and wants to be the go-site for Indian movies. There’s not a service that says [to Indians] come to this one spot and get it all. We’re trying to put together a real quality experience, coupled with a strong catalogue of films. Smith reveals that, while in the short term the focus is on movies, the streaming service will soon add TV show content, and is looking into the possibility of expanding into other genres, including independent films, lifestyle and sports-related content. “The couch potato era is over”, Smith says, and Spuul is focused on providing a equal experience across its website, mobile and tablet apps. Today’s video fans are multitaskers who consume content from different platforms, often on the go, he adds. Though it has been out in public for little over a month, Spuul has been a long time in the making. The concept of the service first came about in 2010 in Singapore when its three founders — which include Sony Entertainment TV in India founder Sudesh Iyer and serial entrepreneur S Mohan — first put a blueprint together. Licensing and content deals take time to strike and the company didn’t begin working on the platform and other tech developments until the middle of last year. Smith came aboard in early 2012 after departing Yahoo — where he’d run business development in Asia — and he’s enjoying the change of scene at Spuul’s Singapore-based office. The company’s other location in India has five full time developers who are focused on building and optimising the service. Having launched its maiden apps for Apple devices, Android is next in line. Given that the Google-owned operating system is thriving in Asia, and most of the world, the move will likely open Spuul up to larger audiences in India and the surrounding area.